Josie grew up in country NSW and had many varied professions, homes and travelling adventures before arriving at UNSW to complete a BSc degree in 2006. In 2007 she joined the Ferrari lab to undertake an honours project and remained to complete her PhD, characterising the impacts of diesel fuel on the microbial ecology of sub-antarctic soils, and determining site-specific remediation end points based on the soil microbial ecology response﻿s. Josie's primary research goals thus far have been centred on identifying microbial indicators of contamination specific to polar soils. The pursuit of these goals has expanded my research more broadly to include polar soil microbial ecology and the drivers of community composition and function. "I have a great passion for the outdoors and feel extremely lucky that my research has enabled me to experience the sub-Antarctic up close, living and working on Macquarie Island for months at a time." Sarita is a PhD student from Kathmandu, Nepal. Sarita joined the team in 2013, and has a Master's degree in Food Microbiology from National College, Tribhuvan University. Her MPhil focused on assessing the unique microbial diversity of the Browning Peninsula. Her current research is looking at the role of fuel contamination in microbial community dynamics and bioremediation of Casey Station, Antarctica. Nicole joined the Ferrari Lab to complete first class Honours in 2014, following on from a Bachelor of Biomedical Science at UNE. Her current research focuses on bioactive secondary metabolite production in Antarctic bacteria, with a view to discover novel antimicrobial compounds, much needed to address the worldwide crisis of antimicrobial resistance. Nicole is using third generation sequencing to survey these extreme soils for genes typically associated with antimicrobial production; polyketides and non-ribosomal peptide synthetases, and employing novel culturing techniques developed by the Ferrari Lab, to select and characterise prolific antimicrobial producing Phyla; Actinobacteria and Proteobacteria. Sally is a PhD candidate from the small country town of Dorrigo, NSW. She completed a Bachelor of Arts/Bachelor of Science majoring in Asian Studies, Biotechnology and Molecular Genetics at the University of New England before joining the Ferrari lab in 2014 to complete an MPhil. Sally's research uses microfluidic qPCR to assess microbial processes such as nitrogen cycling in the soil, and how hydrocarbon contamination affects these processes. Sally has received a student travel scholarship to attend the BioInfoSummer workshop and recently presented her work at the SETAC annual conferences in Singapore and Hobart. When not getting excited about microbes, Sally likes exploring jungles, reading old books and hanging out with her Toastmasters club. Eden commenced her PhD in mid 2017 and is jointly supervised by Professor Mark Tanaka. Her interest lies in combining art and science through the analyses and presentation of big data using the R language. Currently, her project revolves around the influence of aeolian processes on the assemblage of polar soil microbiomes. Outside of the lab, Eden enjoys landscape photography, hiking and spending time with her beloved dog - Heiliar. Angelique joined the Ferrari lab as an undergraduate honours student in 2017. She is now continuing her studies with us as a PhD candidate. Angelique is investigating the extent that trace gas oxidation drives microbial carbon fixation in many different extreme environments where few alternative energy sources are present. In her spare time, Angelique enjoys rock climbing, baking and hanging out with her dog Pudding. As part of her Bachelor of Biotechnology degree, Nicole studied in Malaysia for 2 years before coming to Sydney in 2016 to complete her programme. She then continued onto honours with the Ferrari Lab in 2017, and after securing a prestigious International Research Scholarship, began her PhD with the lab in 2018. Although initially unsure of where Biotechnology would lead her to, Nicole believes that Honours was a good opportunity to help her discover where her passion lies. Speaking of non-academics, she LOVES ultimate frisbee "Yes, it is not a common sport, but I assure you, it is one of the COOLEST sports games!!". Carol is a PhD candidate from México. She completed a Bachelor of Biotechnology degree and a Master in Biological and Chemical Sciences at the Autonomous University of Querétaro. Carol joined the Ferrari Lab in 2018 and her research is focused on understanding the Microbial Bioactivity and Their Role in Antarctica. “It is an intrigue for me to understand what are the secrets that the simplest units of life use to stay in extreme conditions, to explore the potential of their bioactivity is my motivation every day”. Jieyu Liu is an Honours student from China. Jieyu joined the Ferrari Lab in 2018 after completing a Bachelor of Biotechnology from UNSW. Her current project is focused on nitrification and nitrogen cycle on Antarctic polar soil, optimizing the urea-amended soil washing and soil rehabilitation. When not weighing and extracting DNA of the Biopile 7 soil, Jieyu enjoys rock climbing, hiking, and camping in Blue Mountains. Devan joined the Ferrari Lab in 2019 as part of Honours after completing a Bachelor of science and business, majoring in Biotechnology and Microbiology. His current project focuses on isolating archaea from Antarctic soil cultures and analysing their ecological contributions. In his down time he enjoys traveling, riding motorbikes, cooking and dancing. Alistair joined the lab on a casual basis in July 2018. He jumped on board after finding an interest in the research coming out of the Ferrari Lab and Sally's work on bioremediation. He is currently in his last semester of undergrad, finishing with a Bachelor of Science and Business majoring in Biotechnology. When not donning the Lab coat, Alistair likes team sports, the outdoors and surfing. After his undergrad, Alistair's looking to undertake his Honors in environmental microbiology. Lauren joined the Ferrari Lab in 2018 for Honours, because she thought, ”they study the microbial equivalent of a cactus, and that's pretty cool". She also won an Australian Society for Microbiology Undergraduate Microbiology Prize for her previous coursework. Now she's investigating the denizens of dry, nutrient-poor Kakadu soils, including the candidate phylum Eremiobacteraeota (or WPS-2). With her spare time, she'll do literally anything that could be considered a hobby, but mostly it's tinkering or drawing. Chengdong Zhang is a PhD candidate from China. 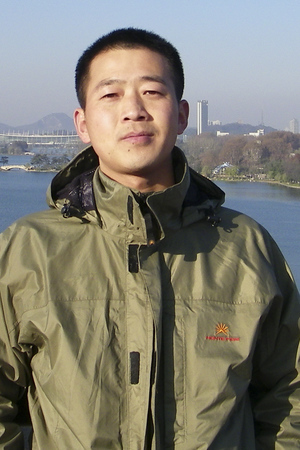 Chengdong joined the lab in 2010 and has a Bachelor and MPhil from UNSW. His current research is focused on polar fungal biodegradation of petroleum hydrocarbons. Chengdong is interested in recombinant protein and enzyme expression, synthetic biology and environmental microbiology from biotechnological application. Mukan completed his PhD thesis, entitled 'Exploring Microbial Dark Matter in East Antarctic Soils' in 2017. Mukan joined the Ferrari lab in 2009 with a Bachelor of Science from The University of Sydney and Masters from the University of New South Wales. His research focused on the microbiodiversity on extreme Antarctic soils, alternative carbon acquisition pathways and cultivation of novel bacteria. Following his PhD in the Ferrari Lab, Mukan returned to China, and is currently working as a postdoctoral researcher in the Chinese Academy of Sciences' Institute of Tibetan Plateau Research. Lucien Alperstein, Student Lab Assistant & Student Intern. Lucien worked in the Ferrari Lab as a lab assistant & student intern during his third year of Advanced Science (Microbiology) at UNSW, after completing a Bachelor of Communications at the University of Technology, Sydney, in 2012. Lucien is passionate about bacterial and microbe-eukaryote symbioses, science communication, genetics and recombinant protein expression. In his spare time Lucien explores food and beverage microbiology, preserves the genes of heritage apple varieties and likes contemporary art, camping, surfing and riding his bicycle. On top of his assistant duties, in 2017 Lucien started a research project with the Ferrari lab as part of his undergraduate coursework, screening for novel antibiotic production in previously isolated polar soil bacteria. After graduating, Lucien completed further work as a research assistant in the Marquis lab, also in BABS, before heading down to Adelaide to pursue further studies. Linzhou Liang, Visiting Fellow, 2015-2016. Linzhou is from the Institute of Soil Science, Chinese Academy of Sciences and joined the team in 2015. He has a PhD from the Chinese Academy of Sciences and a master from South China Agriculture University and spent two years at the Lab. When not looking down a microscope Linzhou likes playing badminton and volleyball. Iskra completed her honours year with the Ferrari Lab as part of a Bachelor of Biotechnology at UNSW. Her project involved culturing traditionally 'unculturable' bacteria from Antarctic soils. In her spare time Iskra plays violin, viola and accordion, goes bushwalking and enjoys travelling. Louise Baldwin, Bachelor of Science (Molecular and Cell Biology and Microbiology) Student Intern (2016). Louise hails from Port Macquarie, NSW, and joined the Ferrari lab on a research scholarship in the latter half of 2016 for a research internship as part of her Bachelor of Science, with a double major in molecular and cell biology and microbiology at UNSW. In the lab, Louise assisted in the search for antibiotics in microbes isolated from Antarctic soils. When she’s not looking down a microscope or playing with DNA, Louise enjoys adventure walks and English comedy box sets. Louise is currently completing her honours at the Garvan Institute researching tumour progression. See here for research partners and collaborators.